Want to always see and use your favorite Dashboard Widget? You can bring Mac X Dashboard items to your Desktop and make them show persistently. Follow these steps. 1. Find your Dashboard hotkey. 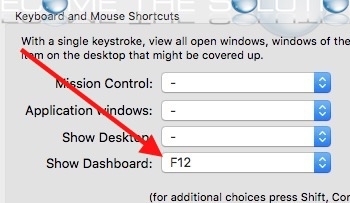 Go to System Preferences -> Mission Control and see your hot key for Dashboard. 5. Open Mac Dashboard. Click on any Widget and hold the mouse button while hot-keying back to your desktop. Your widget should appear on your Desktop. Repeat this action for as many widgets you would like placed on your Desktop. Note: If you still cannot mouse-click and drag widgets, issues the killall Dock command again in Terminal. 2. You will need to put back the Dashboard Widgets in the opposite fashion. On your Desktop, mouse-click a widget then hot key to your dashboard and release each widget to put it back on your Dashboard.